Choosing a color for your granite countertops is an important part of setting the overall color scheme for your kitchen. This is a guide about choosing granite countertops. What color granite typically goes with Victorian ivory cabinets? Should it be light or dark? I have a 8x13 galley kitchen that has ginger cabinets, white appliances, and gray vinyl tile floor. I want to upgrade the counter top with black granite, but I'm wondering if that will be too many different colors in such a small space. The appliances are less than 5 years old so we won't be replacing them. White, black, and grey are all considered neutral. In fact I have read several articles that refer to white and black as being "no" colors. basically it is a matter of what you like. I have never heard of anybody matching the color or appliances to anything. Appliances are a necessity, not a thing of beauty. I wouldn't worry about too many colors. Black and gray are almost the same color. They are just different shades. White is also not generally considered a "color." The only pop of color you have is ginger, and it may not be much, depending on how much of it there is and what shade it is. After you do the upgrade, you might want to consider adding some splashes of color to brighten the room. They don't have to be permanent. Just some fruit or a flower arrangement on the table will give you a good idea of which colors will coordinate well with what you already have. Take your time and plan it the way you want it. Buy a cheap shiny black shower curtain, cut it in half, and put on the counter tops to get an idea of how it will look. Also your accessories will either pull it together or break it up, so put them on the shower curtain for a better idea. I work as an appliance and kitchen design specialist and what you want to do is think about the size of your kitchen and how the light comes in. You don't want to go too dark and you also don't want a kitchen that shape and size to be overwhelmed by the granite so that is the only thing noticed when you come in the kitchen. Take a cabinet drawer and, if you have it, a sample of your floor to the home improvement store and match those things to a counter top sample and put all of them next to white appliances. You may find that you go in a totally different direction in counter top colors. 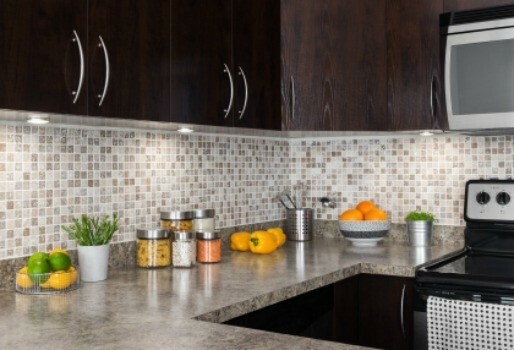 You might also want to look at quartz as well as Silestone as counter top options. While the other responses offered some great advise, I would suggest looking at granite in the tan/streaked with gray colors category. I've seen this color used with white appliances & wood floors - I thought it tied in nicely. Happy shopping! Gosh, this would make it even smaller kitchen. My kitchen is 19 x 15 (10 ceiling) and I would not do anything except light counter. I spend my time in my kitchen. Would not want it to feel like the closet. I want to suggest quartz rather than granite to you. It's a little less expensive, but that's not my reason. My son had granite counters put in his new home and found that they have to be sealed on a regular basis and it left a ring from a glass of milk which he had to call someone in to resurface. Fortunately for me, this all happened before we refurbished our old kitchen. We used Avanza but there is also another brand called Silestone. You can go on line and see the colors offered by both. I can put a hot pan on my counter, cut directly on it and nothing seems to hurt it. I have had it for 6+ years. How about a ginger/white/gray combination. Take a look and see what you think. If you find a pattern you like, I can tell you, you will be very happy with quartz. I like the suggestion about the black tablecloth. I like black counters, and I think it could be very dramatic. Personally, I'd get a couple of black throw rugs, or a very simple black and ginger. They would pull your eyes up, from floor to ceiling. A basket or two on the counter of the appropriate "ginger" color. I would go with a grey granite counter. Black shows every speck of dust. I have Black appliances and I have to clean them several times a day, if I want them to look their best. I have grey tile floors and grey walls with white cabinets. I am very pleased with it. My kitchen cabinets are mocha colored. What color granite countertop would go well with them? If you go with a dark color the kitchen may seem dismal. What color is your flooring? Maybe pick some color out of that unless it too is dark. In an open concept living room+dining room+kitchen with lots of natural light, I have ivory color cabinets with a white tile backsplash, brushed steel hardware, and stainless steel and black kitchen appliances. The kitchen floor is white-cream tiles, whereas the living room and dining room have American standard (medium color brown) wood flooring. My kitchen chairs are in steel with black cushions, living room furniture is dark (egg plant/black) and dining table is very dark mahogany. The drapes are cream silk. Wall paint is all white. I am planning to change my counter top to granite. What color granite will be best? Because of the cost of granite I would pick whatever color you like. Any color will go with white and black. The furniture is something that you will gradually replace over time, whereas the counter tops will probably be permanent because of the cost. "Google" kitchen makeovers and look at pictures that have some of the colors in your existing kitchen. When you find a color combo you like, note the color of the counter tops, or visit a home repair store like Lowes or Home Depot. See how they match granite with different flooring/cabinetry. Worked for me! I have pickled oak (light) cabinets, black appliances (and had a new copper colored tile floor installed) I chose black, speckled granite look laminate. It was a different color than I thought I originally wanted! I am so happy with my now 4 year old makeover! This color scheme sounds very cool - do you need to add warm tones to the rooms? A medium shade of grey is what I would pick. You have the ivory on your cabinets with the steel handles, then white backsplash and light flooring. Your appliances ss will balance out the handles, but you have little to nothing (so it sounds) to balance out the black. (Are you talking ss w/black trim appliances or some ss and some black?) Anyhow, to balance out the black, but not darken too much in your kitchen, I'd go with med grey with darker speckles. You could go black granite with light grey, but on days that are not sunny and bright, it could make your kitchen look really gloomy. Just a thought. I would be interested in what you do come up with, though...post a few pics? I have Shiva gold granite on the bathroom floor and I'm using a sandalwood vanity. Which color granite countertop can I use with these? Black will look nice with these colors, good luck. Black with flecks of gold. You could also go with a black one that has a few other colors in it. If you're trying to decide between granite and marble, go for the granite. I put in marble. Big mistake. It scratches and stains too easily. If you have a large bathroom, black would be great, but in a smaller one, it'll make it look smaller. If you have a smaller one and still use black, make sure you have great lighting, natural light, and mirrors that reflect that natural light to keep the bathroom looking too cramped. Also, keep your wall paper or tile design on the walls simple. That being said: there should not be more than two colours in a small bathroom, main and trim, with the accent matching the trim. Three in a larger one. Main, trim, and accent. Your towels should be co-ordinated to your trim and accent. Your rugs can go either way. Nice way to bring out trim/accent, or blend in with main colour. But don't over do it, keep it simple, often simple is the most elegant. We are considering replacing our kitchen countertops with either quartz or granite. Would any of you please tell me pros and cons of the two? Neither! From personal experience I hate both of them. Granite has to be pampered. There are so many household items/chemicals that will ruin the finish. I have it in my bathrooms and in 3 years have had to have it refinished twice. The Quartz can't withstand bangs and hits. If you have children, pets, or even a slightly clumsy husband, then go with a manufactured finish like Corion. You can pick out something that is just as beautiful as granite and will still be in good shape in 20 years. I have yellow walls, oak cabinets, and sunset acacia floors. What color granite would look nice? I wanted black because all of our appliances are black except for the fridge, but I hear black shows everything so that's out. Suggestions please and thanks. What color granite counter tops should I buy to go with natural oak cabinets? We are remodeling our kitchen and need some advice. We have chosen antique white cabinets with Minsk granite counters for the main body. We have gone with a moss green cabinet for the island and wanted to know if Ubatuba green granite countertop would look OK with it. I know everyone says you should go with more of a contrast, but I wanted to know if this would work. We are also putting in dark wood floors.